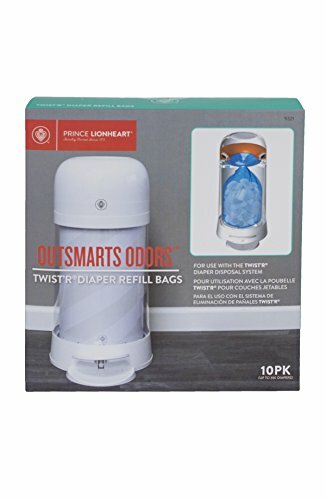 Prince Lionheart Twist'R Diaper Refill Bags-20pk by Prince Lionheart at My Pregnancy Place. MPN: unknown. Hurry! Limited time offer. Offer valid only while supplies last. a 7-Layer Bag that traps odor molecules. Each bag holds up to 45 newborn diapers and can be easily lifted out the top and thrown away when full. a 7-Layer Bag that traps odor molecules. Each bag holds up to 45 newborn diapers and can be easily lifted out the top and thrown away when full. Parents can now breathe easier 'cause there's no more dirty diaper stench burning a perma-memory into your nose.